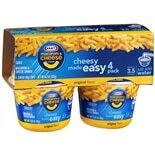 Shop Kraft Macaroni & Cheese Dinner (4.1 oz. )4.1 oz. 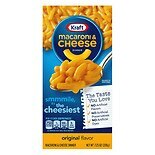 Shop Kraft Macaroni & Cheese Dinner (7.25 oz. )7.25 oz. 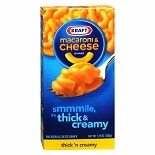 Shop Kraft Macaroni & Cheese Dinner Original (7.25 oz. )7.25 oz. 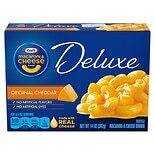 Shop Kraft Macaroni & Cheese Dinner Deluxe (14 oz. )14 oz. 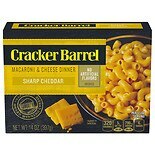 Shop Cracker Barrel Macaroni & Cheese Dinner Sharp Cheddar (14 oz. )14 oz. 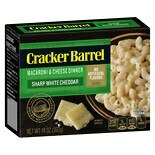 Shop Cracker Barrel Macaroni & Cheese Sharp White Cheddar (14 oz. )14 oz. 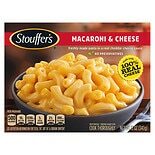 Shop Stouffer's Craveable Recipes Frozen Entree Macaroni & Cheese (12 oz. )12 oz. Sometimes you need something delicious to get you through the day and macaroni and cheese can make the perfect lunch or dinner meal. There are a wide variety of macaroni and cheese mixes that will please your taste buds and keep hunger pangs at bay. Walgreens.com has well-known brands like Kraft and Stouffer's. When it comes to easy meals, macaroni and cheese is at the top of the list. 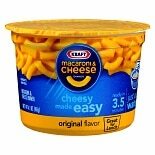 Most macaroni and cheese boxed dinners require nothing more than a dash of milk and some butter or margarine. Some of them can even be made with water. Add a bit of extra flavor to your macaroni and cheese by using your favorite spices and seasonings. Salt and pepper enhances the flavor without overwhelming the pasta, while garlic powder and red pepper flakes give your macaroni a nice kick. Add canned or frozen vegetables to a pot of prepared macaroni and cheese to make sure you get enough produce in your diet. Heat and eat meals are an easy way to enjoy a hot meal on a hectic day. If you want something other than macaroni and cheese, try one of the other boxed meal kits offered by Walgreens.com. Soup is another meal that is hearty and satisfying, yet easy to prepare. Serve a steaming hot bowl of soup with some crackers, toast or croutons for a quick and tasty meal. Don't forget to finish your meal with a delicious dessert such as cookies or boxed pudding.